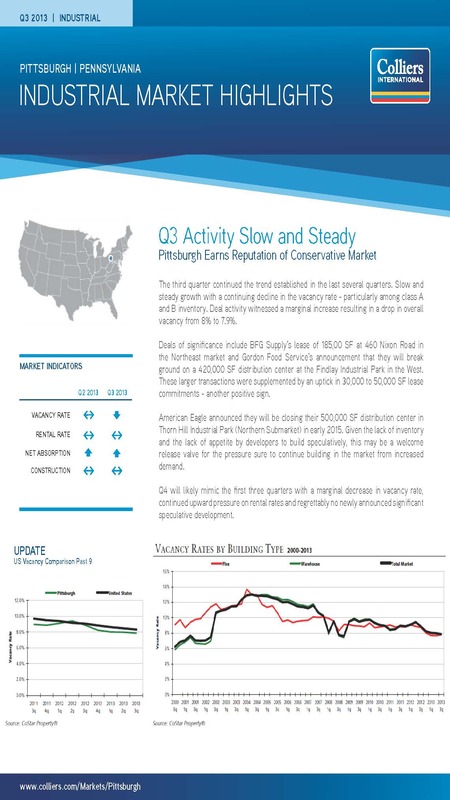 The Pittsburgh market continues to live up to the national hype, posting strong gains in all product types while sales continue to remain solid. The OFFICE MARKET for the Third Quarter of 2013 saw an overall vacancy rate of 8.1% with a quoted rental rate at $18.84. While the vacancy rate ticked up just .1% over the Second Quarter of 2013, the quoted rental rate surged 21 cents per square foot from $18.63. As compared to the Second Quarter of 2012, the vacancy remained the same while the quoted rental rate is up 11 cents per square foot. The Oakland Market near the Universities continues to shine with an effective zero percent vacancy rate. The Class A market in the CBD enjoys a 6.8% vacancy rate with a quoted rate of $24.77 psf, while the Greater Downtown market is even better with a 2.5% vacancy rate and a $22.43 psf average for the Third quarter of 2013. The third quarter continued the trend established in the last several quarters. Slow and steady growth with a continuing decline in the vacancy rate – particularly among class A and B inventory. Deal activity witnessed a marginal increase resulting in a drop in overall vacancy from 8% to 7.9%. Deals of significance include BFG Supply’s lease of 185,00 SF at 460 Nixon Road in the Northeast market and Gordon Food Service’s announcement that they will break ground on a 420,000 SF distribution center at the Findlay Industrial Park in the West. These larger transactions were supplemented by an uptick in 30,000 to 50,000 SF lease commitments – another positive sign. 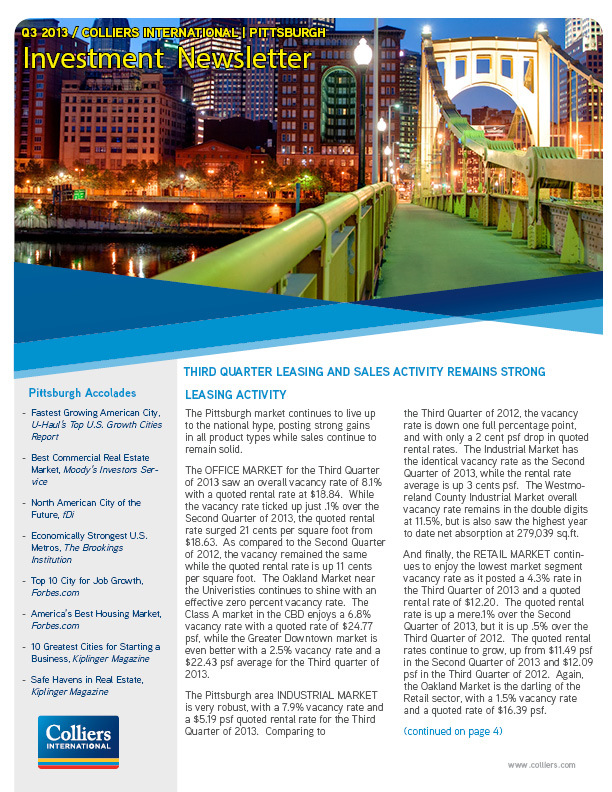 Pittsburgh’s retail vacancy rate increased in the third quarter 2013, ending the quarter at 4.3%. Over the past four quarters, the market has seen an overall decrease in the vacancy rate, with the rate going from 4.7% in the fourth quarter 2012 to 4.4% at the end of the first quarter 2013, 4.2% at the end of the second quarter, to 4.3% in the current quarter. 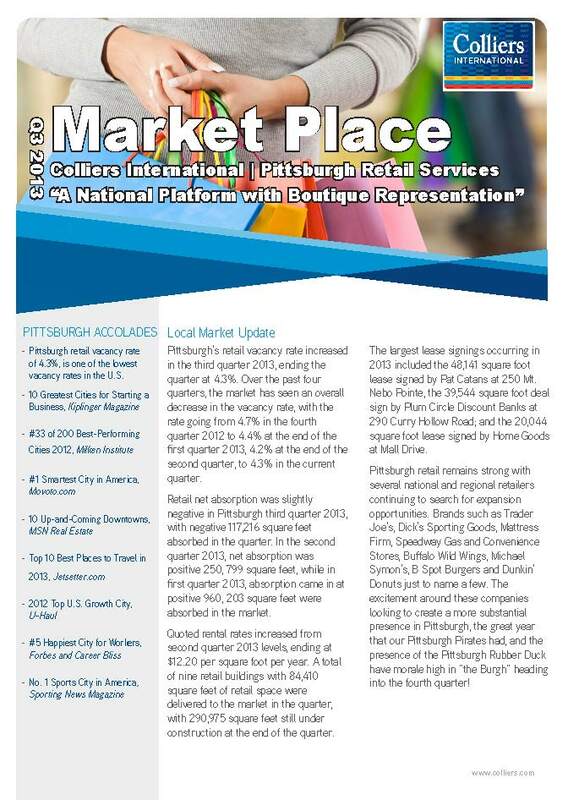 Retail net absorption was slightly negative in Pittsburgh third quarter 2013, with negative 117,216 square feet absorbed in the quarter. In the second quarter 2013, net absorption was positive 250, 799 square feet, while in first quarter 2013, absorption came in at positive 960, 203 square feet were absorbed in the market. 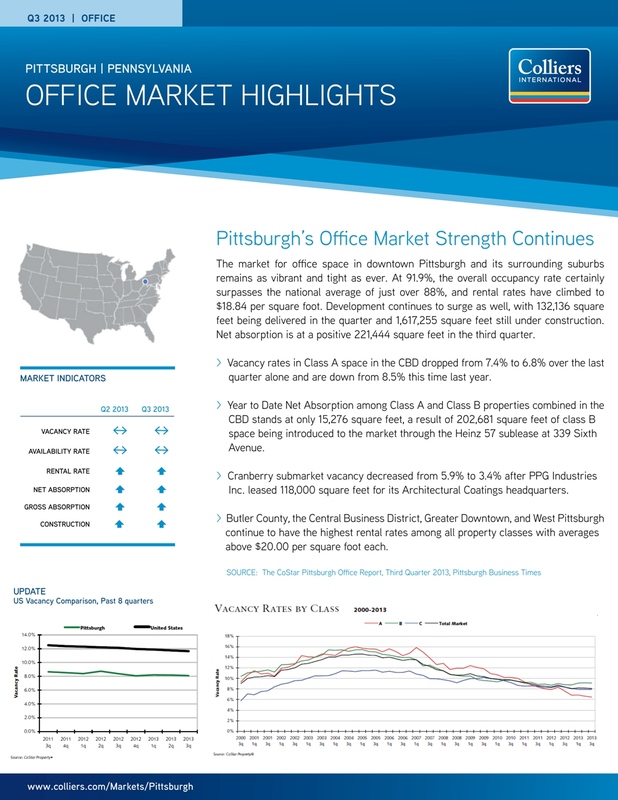 The market for office space in downtown Pittsburgh and its surrounding suburbs remains as vibrant and tight as ever. At 91.9%, the overall occupancy rate certainly surpasses the national average of just over 88%, and rental rates have climbed to $18.84 per square foot. Development continues to surge as well, with 132,136 square feet being delivered in the quarter and 1,617,255 square feet still under construction. Net absorption is at a positive 221,444 square feet in the third quarter.